Guess how much Little Nutbrown Hare loves Big Hare. As far as his arms can stretch! As high as he can hop! And all the way to the moon… Sometimes when you love someone very, very much, sometimes you want to tell them how great your feelings are. But as Little Nutbrown Hare and Big Nutbrown Hare discover, love is not an easy thing to measure. An adorable board book edition of a classic snuggle-up story which celebrates togetherness and family love. Winner of the American Booksellers Book of the Year Award. Some fun cheques to give to your loved ones! Draw something you love here. Make your own Guess How Much I Love You card. Can you find the match the hare pictures? Help Little Nutbrown Hare find Big Nutbrown Hare through the maze. I love this book. I have had it since I was younger and I still love it. My mum used to read it to me and I had the little nut brown hare toy too! I would recommend it for younger readers and parents to share with their children! 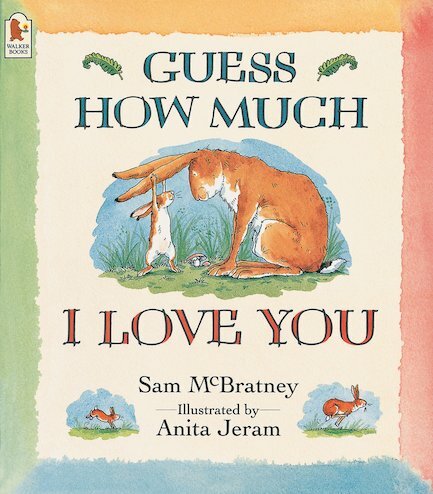 Sam McBratney has twice won the Bisto Award in Ireland, and also won international awards for his classic picture book Guess How Much I Love You, with illustrator Anita Jeram.